If you cycle regularly in any form then it is important to be insured against third party risks. These are claims made against you by a member of the general public, an organisation or an other cyclist on the same ride, in the event that they think you were responsible for damage to them or their property. No one wants to be in that position. We recommend that you join a cycling organisation or club which provides its members with third party cover. For example, Cycling UK and British Cycling do so as part of individual membership. Also Fleet Cycling, as a Cycling UK member group, and pedal2gether, as a Cycling UK affiliate group, both provide ride leader liability insurance to protect our ride leaders. 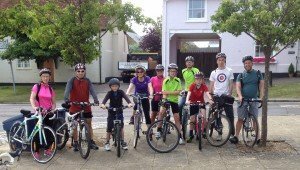 To be a regular rider with Fleet Cycling you need to be a member of Cycling UK. This membership provides £10M third party insurance for you whilst you are cycling, whether on a Cycling UK ride or not, anywhere in the world except the USA and Canada. Full Cycling UK membership also gives you legal claims advice in the event of you claiming against another party for injury to you or damage to your bicycle and kit. We believe the insurance benefits included with Cycling UK membership (full or affliate) are well worth having. Contact colin@fleetcycling.org.uk if you have any questions or if you need further advice.